438 pages. 1996 (Swedish); 2000 (English translation). #6 in the Kurl Wallander series. Genre : Swedish noir police procedure (sounds a lot fancier than just saying it's a Murder Mystery, eh?). Overall Rating : B+. An elderly bird-watcher steps out one night to watch a migration, and is impaled on sharpened bamboo stakes under his booby-trapped bridge. Shortly thereafter, the owner of an orchid shop disappears on his way to the airport. He is found a couple weeks later emaciated, tied to a tree, strangled, and quite dead. Detective Kurt Wallander and his team have the daunting task of tracking down a myriad of clues and leads and trying to see if there is a serial killer on the loose. As with all Kurt Wallander novels, the story takes place in southern Sweden, around Ystad. If you have Google Earth, find it and look at the photos posted there. It's absolutely gorgeous. Detective Wallander, who was totally burnt out in the previous Mankell book I read ("Dogs of Riga", reviewed here), has improved significantly. His drinking problem is now under control, he has a better relationship with his family, and he's no longer thinking about quitting the force. He even has a girlfriend, in Latvia, who he calls every couple weeks or so when he thinks about her. The Fifth Woman has a feel of being how a team of police detectives would really go about investigating a string of murders. There are lots of meetings, lots of legwork, and lots of reporters and politicians clamoring for a quick solution. You plod along with the detectives, keeping on keeping on, and hope that something eventually leads to a break in the case(s). I liked this book because of its true-to-life feel. OTOH, if you're looking for excitement, 438 pages of "real detective work" can get a bit tedious. Also, Mankell seems to set all of his novels in the dreary autumn and winter months of Sweden. Gray skies, freezing temperatures, and persistent dampness abound. Hmmm. That sounds kinda nice right now sitting here in Phoenix. All Whodunit books are the same, right? I used to think that. Plop down a corpse early on, sprinkle a few clues here and there along the way (with an option of a couple red herrings), and somehow have the perpetrator get his/her just desserts at the end. But as I read more murder-mysteries, I'm becoming aware that there are sub-genres. First of all, there are the Cozies, which I never heard of until reading Christina's reviews. One of these days, I'm going to have to find a suitable "starting out" Cozy. Any suggestions? Then there are the "Thrills & Spills" murder-mysteries. Lots of car-chases and close encounters with the bad guy. You know you're reading one of these when the killer invariably decides to go after the protagonist. Third are the "Needle In The Haystack" stories. Somebody gets killed; the good guys/gals spend most of the book talking with suspects and getting nowhere, until a case-breaking clue magically falls out of the sky and into their lap. And finally we have the "Police Procedural" type, such as The Fifth Woman. Not a lot of excitement, but eminently believable. I'm developing quite a taste for these. I imagine there are still more sub-genres to discover, which makes reading murder-mysteries fun. Bottom line - if you're tired of raising your eyebrows and hanging out on the Suspension Bridge of Belief (yeah, I admit it, I plagiarized that from Christina), you may find a Kurt Wallander book to be a pleasant change-of-pace. I would never have guessed this was a mystery/crime novel from the title/cover. It sounds like something i might want to read. 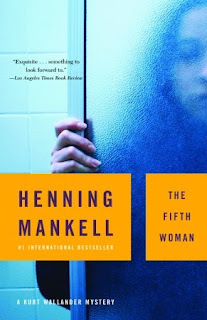 marketing didn't do Mankell any favors with that cover picture. it certainly doesn't cry "Read Me! ", does it?